← Gwibber logo concepts, opinions? This year I’ve been getting my kids into riding dirt bikes. I’ve had motorcycles most of my life, since I was about 6, so naturally I want more excuses to get out and ride. 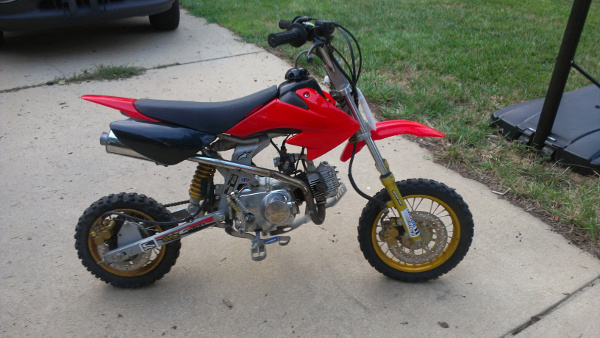 I have a Yamaha TTR-250, and we had gotten a PW50 for Kaden (age 4) and CRF50 clone for Drew (age 7). Of course Ashlyn (age 9) couldn’t possible let her brothers do anything without her, so she has been tagging along and riding Drew’s 50 every chance she could. She is a older and a little taller than Drew, I figured I should look for something a little more advanced for her. Drew’s bike has an automatic clutch, so next step up would be a manual clutch. After a couple months of watching for the right bike on craigslist, I found just what I was looking for. 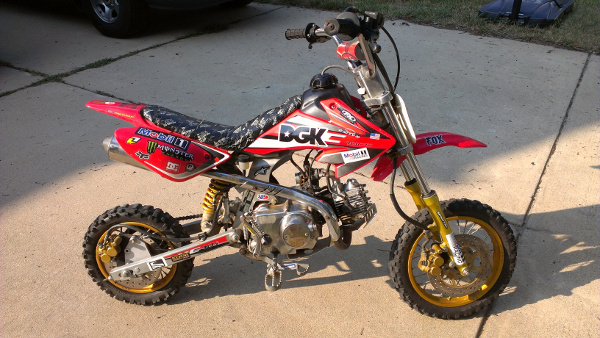 KC Motorsports (honda clone) 70cc motocross style dirt bike, looked a bit rough but in decent shape. What did it have? Motocross style rear swing arm, disc brakes, 70 cc engine with manual clutch. The frame had a little rust and the seat was nothing more than the plastic seat frame wrapped in tape. The engine ran fine, but needed a tune up and a little TLC. The rear brakes didn’t work, probably just a bad master cylinder. The bike has plenty of potential, it really only needs a little work to get it out tearing up the trails. I’m sure we’ll pass it down to her brothers when she out grows it, so I don’t mind putting a bit more work into it. So lets trick it out and make it look great! So far I’ve replaced the rear brake line, changed the oil, replaced the seat, and the plastics. The original plastics that were on Drew’s 50 when he got it (replaced with green ones) are in great shape still, and much better than what was on this 70. Not as flashy looking, we’ll get her a whole new set of plastics and decals. She is looking for something pink, but the boys want her to do black with skulls. I suspect she won’t be aiming to please her brothers. This is enough to get her out riding and have some fun it. I’ve given her a quick lesson on using the clutch and she got in a little practice in the back yard. Next weekend we’ll take it to NC Outdoor Adventures and we’ll see if Drew’s 50 can hang with her on the trails. This entry was posted in Family, kids, motorcycles. Bookmark the permalink.